When I was looking for the recipe for the stawberry jam I stumbled upon a recipe for mint syrup, that sounded yummy and I thought to myself might make a easy peasy mojito. 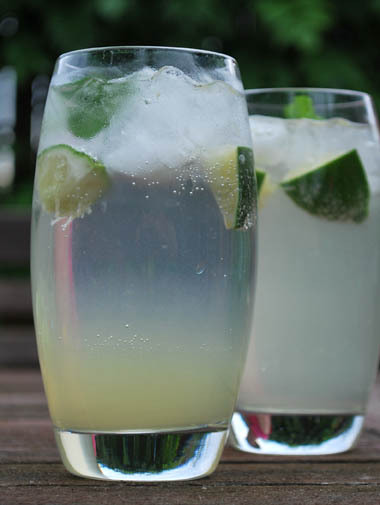 I don’t know about you but I love mojitos when they are made well, but at home I can’t be doing with all that smushing sugar, lime juice and fresh mint in the glass, and this mint syrup recipe although not specifically for mojitos should do the trick. To make the syrup (a lengthy process, but not time consuming!) take 50g ordinary garden mint leaves (I used a big bag of mint from waitrose and stripped the leaves off the stems) and the juice of 2 limes (50ml) – top tip, roll the limes under the palm of your hand on the chopping board first to release the juice and cut them lengthways (the opposite way you cut lemons and other citrus fruit to squeeze) this is the easiest way to get all the juice out. The recipe said lemon juice – but I suplimented limes for an authentic mojito taste. Pound this mix in a bowl with the end of a rolling pin, I put a folded up tea towel under the plastic bowl to protect it a bit. Add 250g sugar and a tsp salt and continue to crush the mint to release its essence. Cover and leave this mixture overnight. In the morning pour 600ml of boiling water over the mint mixture and leave it for a further 12 hours. When the kids are in bed, strain the syrup through a fine sieve into a saucepan and simmer it for a couple of minutes. I bottled mine into a thoroughly washed old pop bottle, although you can keep this for up to 4 months in a sterilised bottle, once opened keep it in the fridge. It made about 1/2 a litre of mix. To make your Mo-cheato, pour 2 shots of mint syrup into a glass over ice (preferably crushed) add a shot of white rum (an authentic Mojito uses Havana Club), top up with sparkling mineral water or plain soda water, add a wedge of lime and a few mint leaves – enjoy! You can, of course, use your mint syrup as a mint cordial or add it to green tea for a sweet minty flavour.